Gas is a symptom caused by air in the digestive tract, while bloating refers to a feeling of enlargement or swelling of the abdomen. These common digestive symptoms often occur together, resulting in intestinal cramping and discomfort. There are a number of effective herbal remedies for gas and bloating, many of which can be found in your own spice cabinet or local grocery store. A key ingredient in gripe water, fennel seed is an excellent herbal ally for fighting digestive complaints. Its active compounds--anethol and fenchone--act as carminatives, preventing gas and helping dispel it more quickly. Fennel seed also helps stop muscle spasms in the stomach, making it useful for the cramping and nausea that sometimes occur with gas and bloating. To make a tea from fennel seed, simply add 1 cup hot water to 1 tbsp. crushed fennel seeds, cool and drink. The crushed seeds may be ingested or strained based on personal preference. 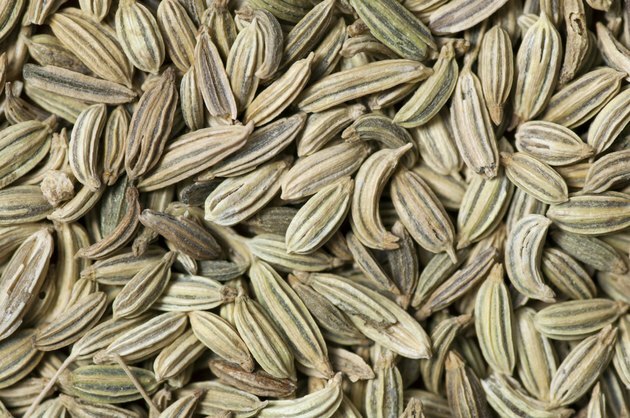 Fennel seed can also be chewed after large meals for its digestive effects. Prized as a digestive aid and breath freshener in India, anise seed is an excellent remedy for gas and bloating. It is often chewed after meals for its sweet flavor and digestive effects. Like fennel seed, anise seed contains anethol--a compound with diuretic and carminative properties. According to the National Institutes of Health, anise seed may be useful for preserving foods due to its ability to kill bacteria like E. coli. Its mild diuretic properties make it effective for treating bloating and water retention, while its muscle relaxant effects help ease tension in the digestive tract to fight gas and cramping. Anise seed may be brewed into a delicious tea by adding 1 cup hot water to 1 tbsp. bruised anise seeds. As with fennel tea, the seeds may also be consumed for their healing properties. For an extra potent brew, add a tablespoon of ginger root powder and fennel seeds. A fragrant herb with an invigorating flavor, peppermint is a powerful remedy for gas and bloating. It contains menthol, which has anesthetic, muscle relaxant and anti-nausea properties. According to the University of Maryland Medical Center, peppermint calms muscle spasms in the stomach and intestines, making it easier for gas to pass through the digestive tract. In addition, peppermint may be helpful in relieving other digestive symptoms like nausea, abdominal cramps and hiccups. Peppermint can be brewed into a tea by adding 1 tbsp. dried peppermint leaves to 1 cup of boiling water for 5 to 10 minutes and straining. Because it can relax muscles in the esophagus and stomach, peppermint may cause a worsening of acid reflux in people with frequent heartburn or GERD. National Institutes of Health: Chemistry, antioxidant, antibacterial and antifungal activities of volatile oils and their components.